This story was originally published by John Dern of Boeing Communications. 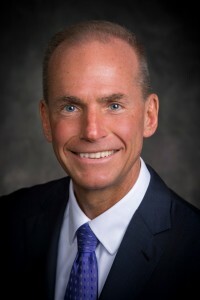 The Boeing board of directors has elected Dennis A. Muilenburg the company’s 10th chief executive, succeeding W. James (Jim) McNerney, Jr., who held the position for the past 10 years. Muilenburg, who has served as Boeing president and chief operating officer since 2013, becomes president and CEO on July 1. My late wife’s cousin, Phil Johnson, was the top man at Boeing in the thirties and early forties. Died of heart attack in 1944 at the peak of the WWII prodUction.